Although Virtual Reality (VR) is often associated with the gaming industry, the technology is not just about gaming. Virtual reality has been around for quite some time now and there have been new VR applications in different fields. It is expected that over 500 million VR headsets will be sold by the year 2025 and the entire VR technology would be worth over $30 billion by the year 2020. This massive growth can't be solely from the gaming industry, but accounts from various industry sectors which are actively making maximum use of this booming technology. Healthcare is one such industry in which there are numerous applications of VR and the potential is open-ended. Medical professionals and scientists have been at the drawing board developing and implementing VR applications for several years now and have come up with of the most advanced applications of VR in healthcare. Today, healthcare organizations need to understand how VR is transforming healthcare and incorporate best practices in their daily operations. In this article, we have listed some of the major VR uses in healthcare and how VR is transforming healthcare. 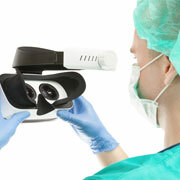 How is Virtual Reality Transforming Healthcare? Training for surgeons is usually carried out on cadavers followed by assisting senior doctors before taking over bigger portions of the surgery. But with VR, this process can be sped up and the time needed for young surgeons to perform real surgeries can be drastically reduced. VR in healthcare can now provide ample amount of practice to surgeons without posing any risk to real patients. Exposure therapy is one of the methods to treat patients with phobias. VR is being increasingly used by physicians and medical professionals to treat such individuals. VR provides a completely controlled environment in which patients are made to face their fears and undergo the training to overcome these fears. Pain is one of the most excruciating feelings experienced by patients. Medical researchers have been finding new ways using VR to treat sharp pain, particularly for burn victims. Distraction therapy using VR is the new method of treating patients with such extreme pain. There are certain VR games developed to distract patients undergoing painful treatments, such as physical therapy and wound care, by overwhelming their senses and pain pathways in their brain. Surprisingly, these games have worked better than morphine. Similar to exposure therapy, VR is put to use to treat soldiers suffering from PTSD. Clinics and hospitals are using virtual simulations caused during the warfare to treat soldiers who are still reliving the traumatic events of the past. Here, the patients are exposed to realistic and immersive scenes, which trigger fear and anxiety in them. They are then guided through the scene to cope up with the situation in which they are placed. The patients are also equipped with methods to deal with such trauma in a controlled and safe environment. Meditation is one of the key methods of treating general anxiety. There are certain VR apps, such as DEEP, which work depending on the patient's breathing, to help them in taking deep, meditative breathes. These work with a band which is worn around the chest and measure the patient's breathing. The apps work as a game and breathing is the only way to control the game. Such apps using VR are of great help in improving the breathing patterns of the anxiety patients. There are numerous people who are aged, disabled, or confined to a single home, room or even a bed due to chronic conditions. They may never go out into the real world and often feel that the time just stopped where they are. Virtual reality in healthcare is bringing new opportunities for such people to let them experience the thrills of the external world, such as a bike ride, a walk on the beach, etc., thereby helping them improve their quality of life. The VR experience can be augmented with other experiences, such as sound, light, wind, and even temperature changes. People who are not able to move or those who are bound to a wheelchair always long to be in the real world outside. VR in healthcare can help such people experience the external world and have an improvement in their quality of life. For instance, Virtual Reality in healthcare can help young kids with cerebral palsy to take their wheelchair over grassy fields or lets children having cancer to swim across animated fish tanks. Recently, CyberPsychology & behavior, a journal for understanding the psychological impact of social networking practices, has published consolidated VR experiences, which not only assess impairments but also retreat them. Scientists have created virtual reality experiences which make the patients get out of a building using doors of different colors. Such methods can assess different levels of the patient's brain damage and help in further rehabilitation. Phantom limb pain is one of the common issues with people who have lost a limb. People without a limb often feel that their fist is tightly clenched and are not able to relax. Such consistent discomfort may result in a sharp, excruciating pain. Scientists have now come up with VR games, which help patients using virtual limbs to and complete certain tasks. These games also help them gain control of their limb and relieve the feeling of painfully clenched fist. This training program was mainly developed for people with autism and helps them in coping up with their social behavior. The training involves brain wave monitoring and brain imaging, and using VR puts the patients into different situations such as interviews or blind dates. This helps young autistic adults to learn the social cues and express socially acceptable behavior. The study found that there was an increased brain activity in brain areas which are associated with social behaviors. Outsource2india is a leading healthcare solutions providing company based in India with an experience of over 20 years. Our team of healthcare specialists completely understands the dynamic nature of the industry due to rapid technological developments. Medical virtual reality has already seen a number of innovations and this figure will continue to increase exponentially in the coming years. We completely understand the massive growth potential of this technology and make maximum use of virtual reality in healthcare. Our healthcare solutions are highly affordable and we also ensure that all the latest technologies are incorporated into the project as per the client's requirement. We follow strict confidentiality procedures to ensure that all the information you share with us remain safe. Furthermore, we provide our services within a quick turnaround time through our multiple delivery centers without compromising on the quality. Therefore, if you are looking for a reliable, trendy, efficient, and cost-effective healthcare services provider, then feel free to get in touch with us!